"Pi is unique in the power space because we are working on multi-device, orientation agnostic, wireless power," said CEO and co-founder John MacDonald, MBA '15. "We can charge multiple devices from the same power source—up to four at a time—without requiring precise positioning on a pad, but still being compatible with existing, safe standards." Pi's charging technology can sense a device's low battery and adjust its magnetic field based on where the device is positioned, rather than requiring the user to place the device on a specific pad or station. "Our first product applies this to phones and small consumer devices in the United States, but we're going to bring it to a variety of applications around the world over the next five years," he added. 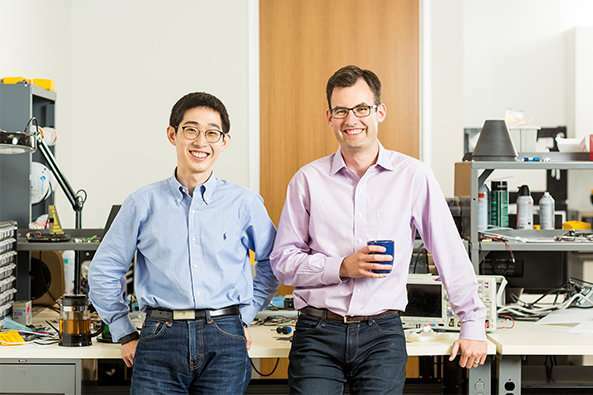 Pi's roots extend back to early 2014, when MacDonald and his future Pi co-founder and chief technology officer, Lixin Shi, Ph.D. '15, enrolled in MIT Sloan's New Enterprises course. The two men were part of a team that pitched a wireless power project during a class competition. While they didn't win the faculty judges' favor, they did earn an audience choice award—giving the students the confidence to explore building a commercial wireless charger. In the summer of 2015, the team decided to try for a first round of funding. By the fall of that year, Pi had officially launched. MacDonald said he learned companies and original equipment manufacturers focus on a one-to-one charging model. Chargers are shipped with phones not as a separate product, but as an accessory for that specific type of phone. "We realized somebody's got to go out and actually make this as a product, and it may even be better coming from an independent company that's saying 'yeah, we'll support all your devices, not just the one from our brand,'" MacDonald said. "So that was more like an industry shift that had to happen for this to become real. We realized the best way for us to begin that was to actually go out and build a product ourselves." MacDonald said even now, Pi is waiting for the next industry shift thanks to Apple's announcement that it was going to have wireless charger capabilities in its devices, specifically with the "Qi" standard. Pi's system was built around a different standard called AirFuel, which—at the time of the first prototype—was supposed to be Qi's successor, MacDonald said. But when Apple announced its choice, the tech giant "kind of made Qi the norm at least for another few years," MacDonald said. MacDonald said the team is already prototype testing its redesigned charger, which also meets Federal Communications Commission safety guidelines for magnetic fields. As for what's on the horizon, MacDonald said Pi is looking into workplace wireless power solutions, as well as expanding its team thanks to the more than $11 million it's raised. The larger team will support new partnership projects with companies in the automobile and medical implant industries. 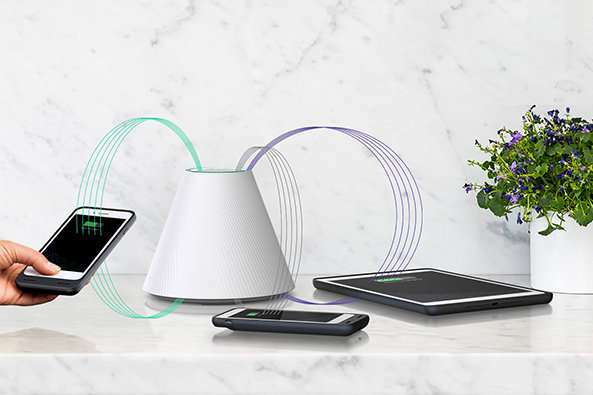 "We know—and a lot of people in industry know—better wireless charging is possible," MacDonald said. "And it's going to happen, and we're kind of at the forefront of that."